Are you planning an outdoor party this summer? Perhaps you are considering planning a graduation, sweet sixteen or even a wedding? We can control many things, but one thing that will remain out of our hands is the weather. You need to keep your guests shielded from the elements as well as add aesthetics to your event. If you are using an outdoor venue, or hosting an outdoor party at your home you may want to have a backup plan in place, such as renting a tent from NY Party Works. Before you rent a tent, you must first decide how many guests you will have so you can determine the size of the tent you will need. 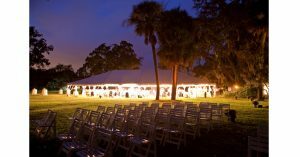 NY Party Works and our total event planning staff will assist you in choosing the correct sized tent for your event. Then you can decide which type of set up would be best for you. The pole tent has a swooping roof design that is thought of as the party tent. The pole tent can be a less expensive option. One drawback might be that the poles on the interior which support the structure can possibly be a visual obstruction for your guests, but most people would not mind. Set-up is simple. There are no frames to cover and the amount of time needed to put the tent up is usually shorter. The frame tent can be put up on any ground surface and there are no center poles on the interior to worry about. This leaves a large space for your table and chairs. Frame tents might be a pricier option, but you might need the extra space if you have a lot of guests. Your guest list will have a big effect on which size structure you choose. The frame tent will give you a clean look that is pleasing on the eye. We also offer a few options for flooring. Some people set up the party tent right on their grass, but if the forecast calls for rain or if it has rained for a few days prior to your event, you might want to consider setting up the tent on top of some kind of flooring. You don’t want your guests sinking their heels into the mud or getting bitten by mosquitoes from the wet grass and soft ground. If you are thinking of putting down a dance floor, you might be spending approximately $1-$4 per square foot, according to apracticalwedding.com. Planning your outdoor party should be fun, affordable and easy. NY Party Works has a full staff of event planners to help you plan the most memorable graduation, sweet sixteen or wedding there is. The experienced staff will help you with space logistics, aesthetics including décor, lighting, flooring, tables and chairs and budget planning. We will help you and educate you on delivery and set up and break down procedures. If you are interested in planning an outdoor party or utilizing a tent rental in the New York area, please contact us at (800) 469-3866 or fill out our inquiry form.